Day one started with landing at midnight then a few hours sleep in the Carlton Hotel before a lightning tour of Antananarivo. The pace was set. What else could you expect with so little time on the fourth largest island in the world? 'Tana' for short, taking in the colonial arcades and markets in the lower district and the old town on the hill with panoramic views and women with babies rushing to the coach to peddle a few crafts. 'They're desperate,' said the guide, 'since the coup in 2009, there's a lot of poverty, anything you buy can help.' 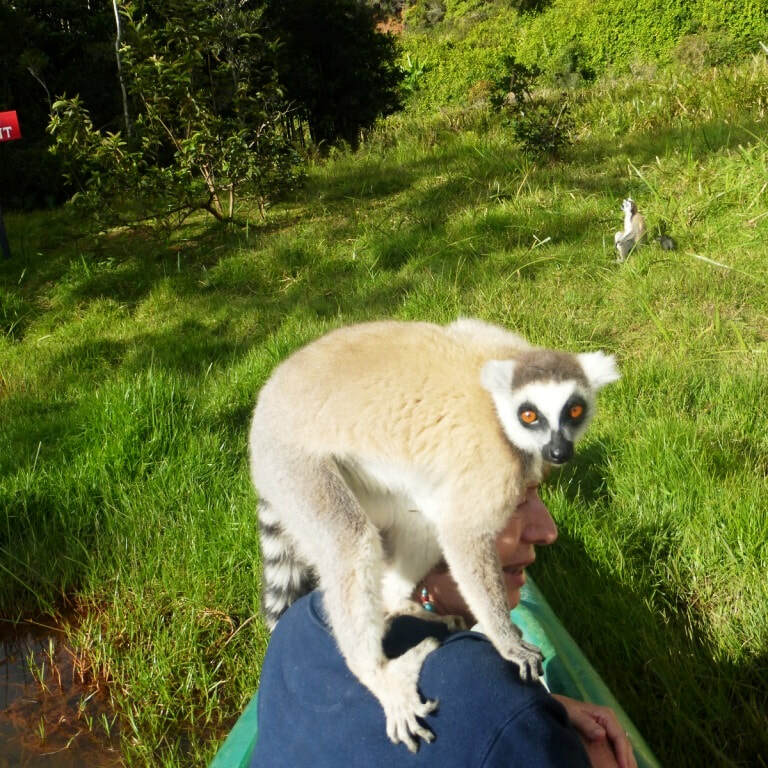 We got the message and new T-shirts, bags, toy lemurs and hats popped up on board every day. We headed south before lunch, past smoking brickworks, raffia drying like fishing nets, red hills with a sprinkling of trees, rice fields in the valleys and mud villages dwarfed by sumptuous white churches. We had plenty of time to enjoy the views, as the driver dealt with potholes and 'priority' trucks, and we reached Antsirabe after dark, just 100 miles from Tana. 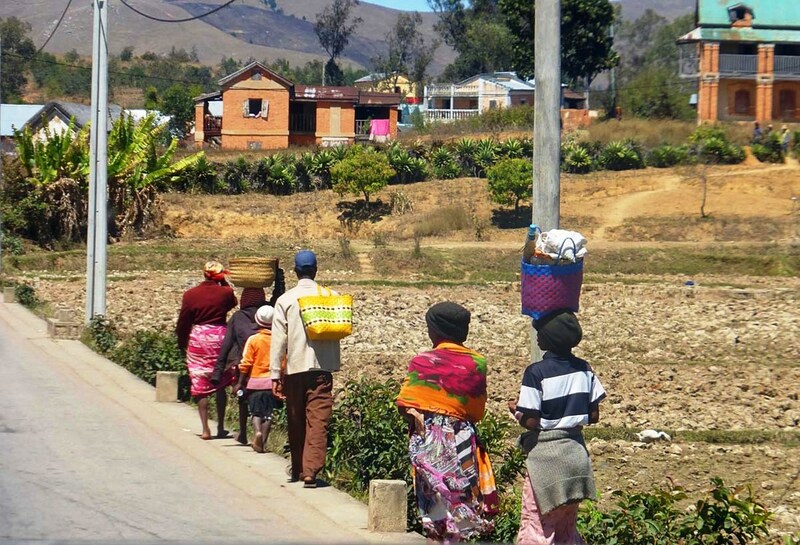 ​On day two, in this second largest town, we were dazzled by rickshaws and food stalls, a monument dedicated to the island's 18 tribes and amazing crafts from zebu horn carvings to the bluish Celestine crystals unique to Madagascar. We could have spent the whole morning wandering through the dusty lanes but time was short and we had to cover over 140 miles to the next stop. ​It was a long slow drive but a great chance to see the local life, farmers with shovels on their shoulders, marching in single files along the road, women likewise, carrying goods on their heads to sell or barter at the nearest market, children walking to school across the fields or the Betsileo tribesmen in the uplands, wrapped in brightly-coloured shawls and small rattan hats that looked like upside down bowls. 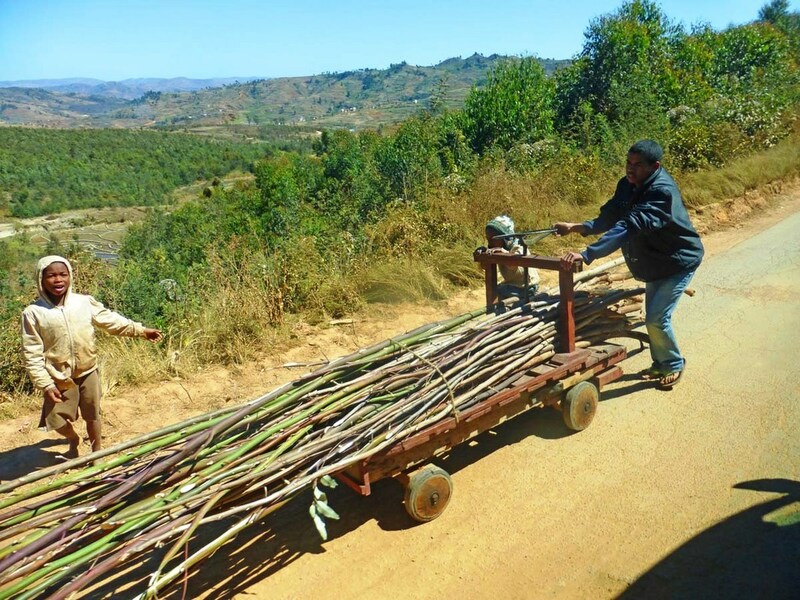 Many pushed heavily laden carts for miles along the road and poor as they are, the Malagasy certainly work hard. ​​Along the meandering road, the scenery was always changing, babbling streams, luminous paddies, boulders and rocks clinging precariously to barren hills, distant mountains silhouetted against the darkening sky. When we reached the Setam lodge at last, in a deep narrow valley, it felt like the back of beyond but we headed straight for the 'night walk' - along the road, not quite what we expected - though when the guide rubbed a banana on a tree trunk, we came face to face with a nocturnal mouse lemur, all glistening eyes and reddish brown fur. 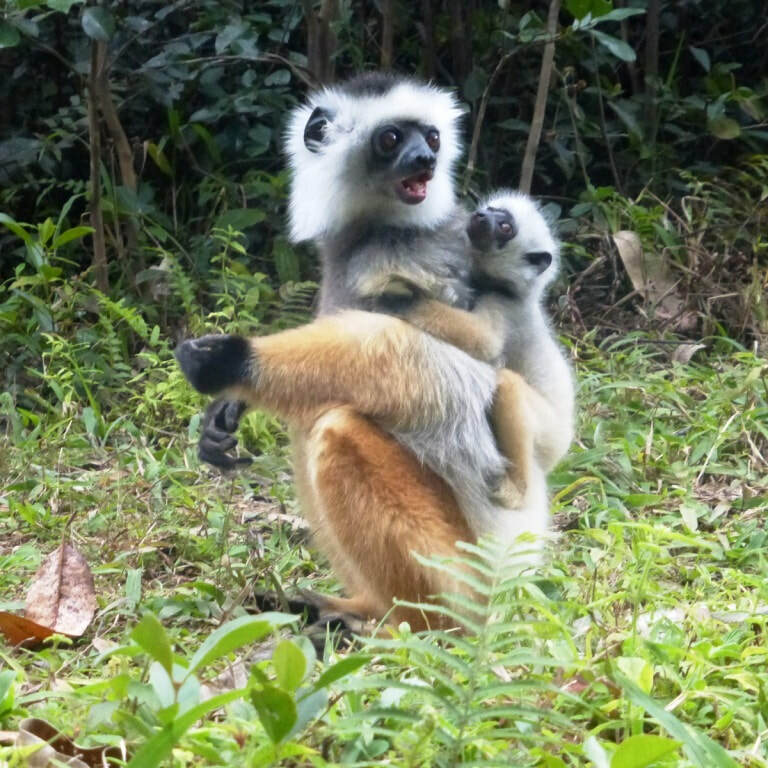 Wow, this was the edge of the Ranomafana National Park where we had come to see the lemurs, at least a few of over 100 species, and we could hardly wait for the next day. ​It rained all night. But soon after dawn the sun rose over the hills and the rainforest began to stir, all shimmering light and mysterious calls. We crossed the Namorona river and followed the local guide up the rough slippery trail, looking at tropical birds, orchids, spiders -there are 350 species- and a giraffe-necked weevil crawling on a leaf. 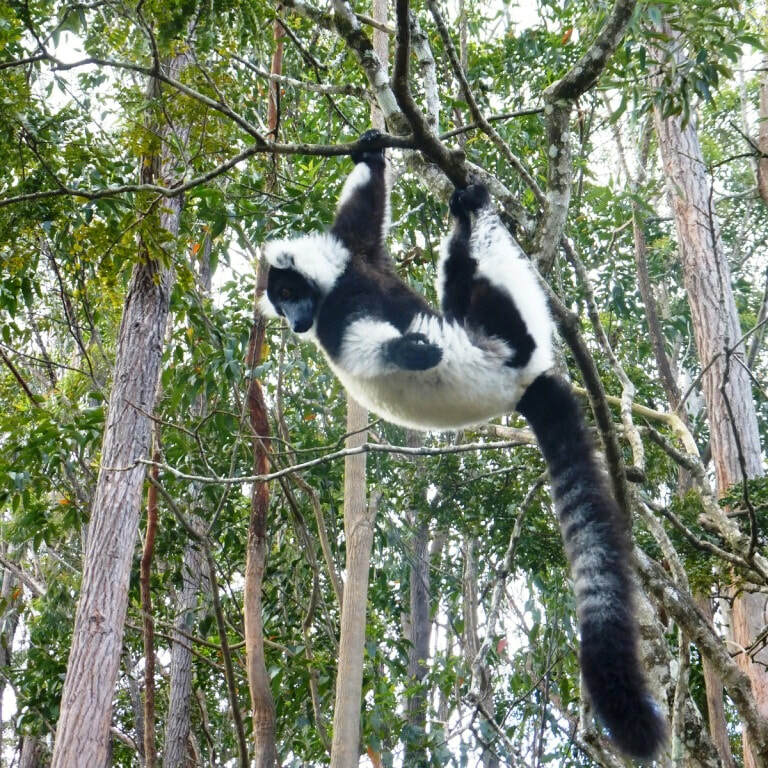 'Stop, this way, be careful…' We could see it, a black and white sifaka lemur hanging upside down, swinging like a child, another leaping from branch to branch, but to get up close, you have to leave the trail and scramble through the trees. It was sheer magic and thanks to the local team mimicking calls and keeping in touch, we spotted half of the dozen species living in the park. 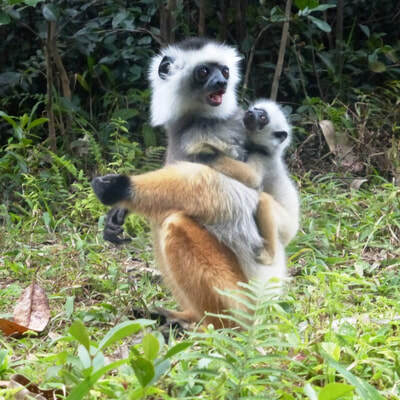 My favourite was the golden bamboo lemur, named after its food and only discovered in 1986. We spent all morning in the park and all afternoon recovering from scratches and bruises, lounging in the Setam garden with wonderful views of the jungle clad hills. ​Day four took us all the way back to the capital, over 13 hours on the same up and down road and another short night at the Carlton, leaving at 6.00 in the morning for our last full day, in Andasibe, east of the capital. This is a popular national park, just four hours from Tana and laced with easy trails suitable for almost anyone. The guide showed us five different types of lemurs, including an amazing indri family, the largest species of all.